Every town has its person of colour who lives a life of blue, green, purple, pink or any colour you can name. From top to the bottom, from details to the whole look it's monochrome and shades of the same colour. 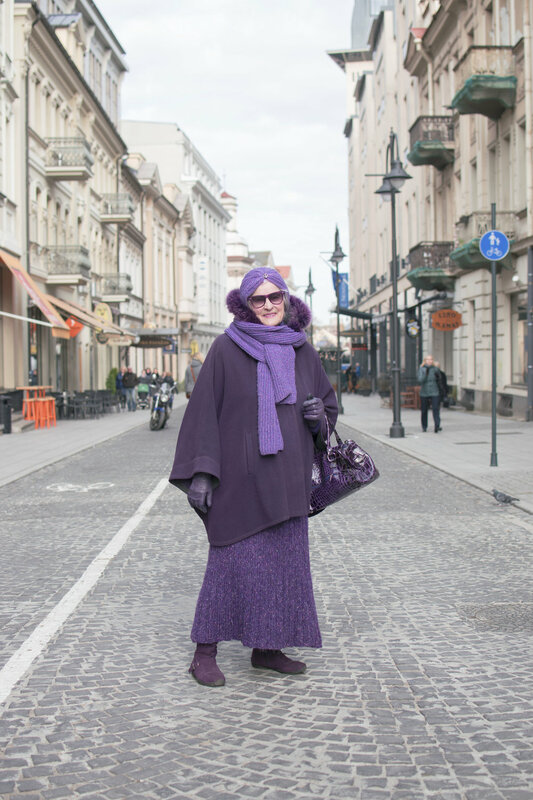 Vilnius, the town where Pretty Ugly girls are coming from also has a Purple Lady. From time to time we started noticing her in town, she reappeared on #supermarketladies several times. Okay, we said, its time to find her, it’s too many questions that need answers!! It took roughly about 2 months of looking aaaand it was just like finding out that a unicorn has a Facebook account and you can text him on a messenger. Few messages back and forth and we met for a cup of tea the very next day. So this is a story on how once upon a time I met my fairy godmother. JUST Like all fairytale creatures - she was shy and modest, spoke in a proper language. From head to toe, she was wearing purple - the dress and the coat, glasses & purse and even her hair were in various shades of lavender. A little background of Valerija - she was born and grew up in a small village, which during the war sadly was destroyed, after the school she moved to Vilnius to study language & litereature and later worked as an editor for an architecture magazine. - Of all the colours, why purple? - I asked. She had two answers that accompanied each other pretty well. First of all, starting from her young days she always used to live through a colour periods just like Picasso did. Also all her life she matched the colour of her outfit to her hair. When it was in a shade of wheat, she embraced it with a tones of blue, when with time it got darker, she moved on to a deep moss green & finally when the hair started to go grey, she removed the yellow undertone with a purple dye and there was no other obvious option as to match everything to the newest hair style. And the second part, you wouldn’t, of course, go all purple if you hated the colour. So what it reminds her of so much, that she wanted to wear it? Back in a small town, she was born in & loves and adores, there was a well. When you look into it, shadows and light mix up with a colour of water and you can definitely see that purple. Although her daughter is a bit critical and kept asking her to stop wearing that kind of clothing, she knew it grew on her. She receives attention and critiques almost daily. Men and women like to approach her on the street and give compliments or at least an expressive thumbs up. And the haters - she doesn't care about them. I wondered - Where could a magical person find clothing that suits her? Where can you get it? They are so detailed and so unique - embroidered roses, glittery threads, textures and patterns, crochet, knitting. EVERYTHING is made by her own hand! And now, sustainability activists take a note - EVERY piece is made from upcycled materials. She’s 81 btw and was doing this long before it was cool. Well duh, obviously, what I was expecting? For her to go to the supermarket and find something? Actually, she does go there. She said everything there is nice but far too expensive. Instead, she goes there for a cup of coffee and ice-cream and watches other people shopping. I was also wondering if she sees anything in today’s fashionistas that also inspires her as much as we aspire up to her. She gave me only one comment on that. Everything is very pretty and she enjoys seeing tasteful choices in fashion, but as far as it goes to inspiration - she feels that her 'inner self' has already formed and couldn’t be affected by something she sees on the street. Where has she got her magic powers of making such interesting stuff? Her determination. She just took knitting needles and started experimenting, back in the days she read some Polish magazines, but now she said it’s so many of them, and in each one, you could find something good, so in the end, you would need to think where to store piles of magazines… too complicated. So she chose to improvise and connect ideas she likes, for example, for a few years she lived in Afganistan, and it inspired her to start making head pieces that resemble turbans or a beautiful rose on a birthday card stuck so much, that now almost all pieces she makes are decorated with them. Patterns did get simpler and more basic with time and she only decorates them with embroidery later, you know why? Because she likes to multitask and at the same time to watch TV or do crossword puzzles. And oh boy, she was upset that she already piled up with so many beautiful pieces for summer, but when the time comes to wear it, she is always out of town and the only ones who can enjoy her work are the squirrels climbing in trees next to her garden.